Carbohydrates, carbohydrates, carbohydrates! Some people think that Nigerian food is only carbohydrates but that's wrong. We have several meals that are low in carbs which you can eat and if you team that with portion control, can help you lose or maintain a healthy weight. 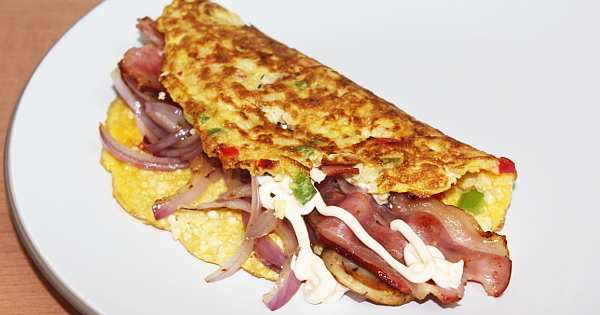 Low carb diet especially the Ketogenic diet is the latest trend in the Nigerian weightloss community. It is now very common for me to get questions like "Is this meal keto compliant?" and requests like "Flo, I am ketoing please can you upload a keto version?" or "How can I make this meal keto compliant?" whenever I share recipes on my Facebook page. Mmhhh, I have always shouted it out loud that I am not a nutritionist neither am I a dietician. I wish I could help with making absolutely ketogenic meals. The only thing I know about the ketogenic diet is that it is a low carb, high fat diet just like the Atkins diet. Those on a ketogenic diet are expected to have 5% of carbohydrates (carbs), 20% protein and 75% fats in their meals. These percentages with portion control enable the body to go into what is known as ketosis. But when it comes to the nitty gritty of the ketogenic diet such as the seasonings to use, the brands of ingredients that are keto friendly and the percentages of the macro nutrients on a plate, I do not know about those. 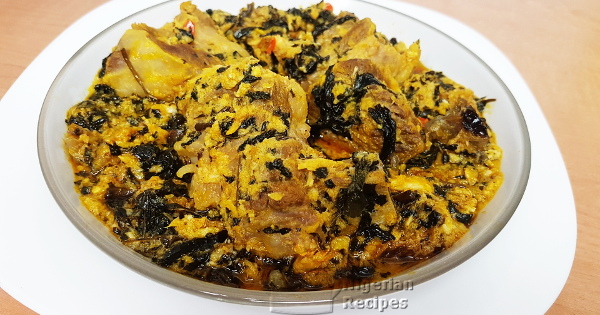 So you will find below, some Nigerian delicacies I believe can be turned into keto-friendly meals with a little bit of tweaking. I will also be adding requested recipes tweaks below. But for specifics, please do your own research about this diet so you will know what to eat and what not to eat. 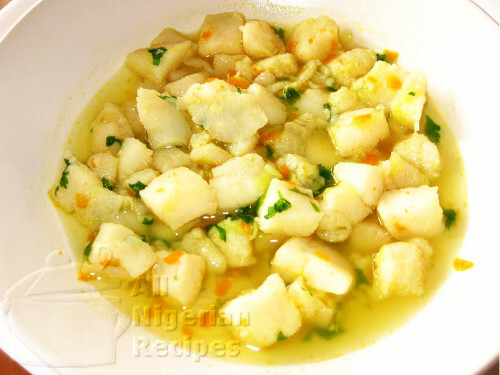 Also check out the Nigerian Soups Recipes, Nigerian Fufu Recipes section for some Nigerian low carb soups and vegetable fufu meals so you do not miss out on your swallows while on a low carb diet. Do you prefer videos? Then click here to watch Nigerian low-carb recipes videos. Enjoy this low carb version of Nigerian Moi Moi prepared with healthy almonds. 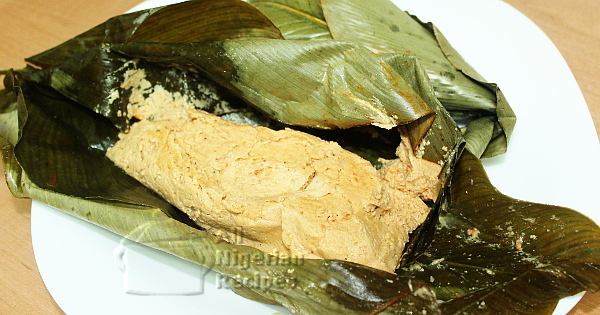 It tastes like Nigerian Moi Moi! If you need a low carb, keto friendly Bitter leaf Soup with no starchy thickener in your life, Keto Bitterleaf Soup is for you. A delicious white fish soup perfect for kids and those on a low carb diet. 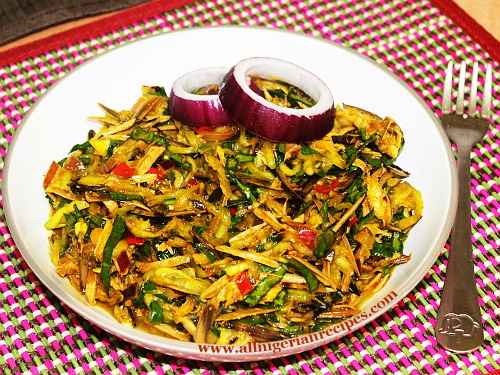 If you love Nigerian Abacha, you can keep enjoying it while on a low carb diet. Prepare Cucumber Abacha! This is the low-carb Shawarma! Click to see how to prepare yours. Cauliflower Fried "Rice" is the most healthy "rice" meal you will ever encounter. 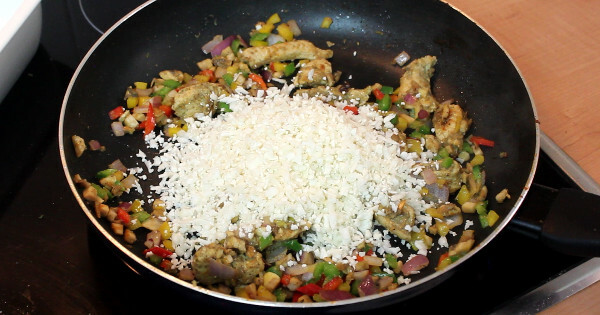 The cauliflower is riced and used to prepare the meal instead of the usual high carb rice.